I am a dedicated Healthcare Professional with an enthusiastic caring approach. Osteopathy uses many of the diagnostic procedures used in conventional medical assessment and diagnosis. Its main strength, however lies in the unique way the patient is assessed from a mechanical, functional and postural standpoint and the manual methods of treatment applied to suit the needs of the individual patient. I have been practising as a Sports Therapist since 1998. I qualified as an Osteopath in 2002. I graduated with a first Class Honours Degree from The London School of Osteopathy. 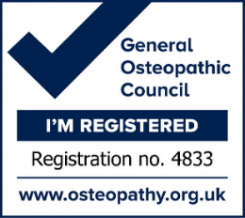 I am regulated by The General Osteopathic Council and a member of The Institute of Osteopathy and I have been a Perrin practitioner since 2010 and have successfully been treating patients with Chronic Fatigue Syndrome/ME. I am also a member of the Osteopathic Sports Care Association and have treated sports related conditions for over 15 years. To work together to enable health to be restored, whether that’s reducing pain, increasing movement or generally improving wellbeing. Primarily treatments take the form of manual therapy involving massage, mobilisation and spinal manipulation for the treatment of musculoskeletal problems. Everyone – Pain is a worrying signal that something is wrong. Osteopathy diagnoses the cause of the pain and can often do a great deal to help reduce the level of your pain. A long term investment for Health and Fitness. If you would like to make an appointment, please go to the contact page. I am a dedicated Healthcare Professional with an enthusiastic, caring approach. Osteopathy uses many of the diagnostic procedures used in conventional medical assessment and diagnosis. Its main strength, however lies in the unique way the patient is assessed from a mechanical, functional and postural standpoint and the manual methods of treatment applied to suit the needs of the individual patient. Having spent the last 20 or so years working within the drinking water industry I decided on a career change and embarked on a 5 year degree in osteopathy. I have spent 8 years treating a variety of patients, ranging from babies to the elderly, using a wide range of techniques including cranial osteopathy. Mr Bones is a valued tool to help us show you where your pain originates and what structures are involved. The better you understand the diagnosis the better equipped you are to make decisions over lifestyle changes that may help.